The Hideaway Bar and Kitchen is one of those local haunts that most people in London (bar those who live in Tufnell Park or around) will have never heard of. Although ‘kitchen’ is in the name, I suspect the ‘bar’ part is a more accurate description. Looks like they’re trying to change that though. I first heard about the place through my friend Alice who was doing the marketing for them. She suggested I come down for the relaunch of their menu, specifically their locally-acclaimed pizzas. DQ and I had a table booked for 6:30, which is *slightly early* by London standards, but apparently unheard of at The Hideaway – we were the only people there for about an hour and a half. It’s always slightly disconcerting when your server can hear your every word, especially when they know you’re reviewing. 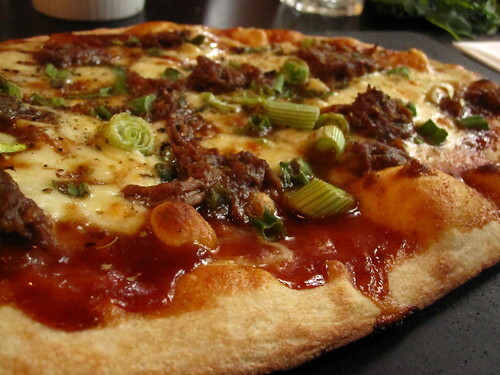 The menu is limitied, mostly just pizzas with a few nibbles and salads, but considering pizza is what they’re known for, it’s probably best they stick to it! As they say, Jack of all trades, master of none. 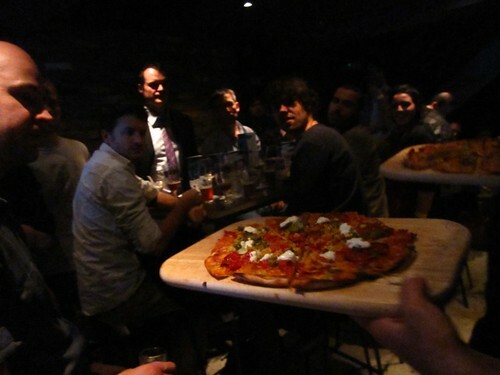 The crust at The Hideaway is thin, but luckily still manages to pass the ‘droopy’ pizza test. I love that. There’s nothing worse than picking up a piece of pizza only to have all the sloppy toppings slide off. 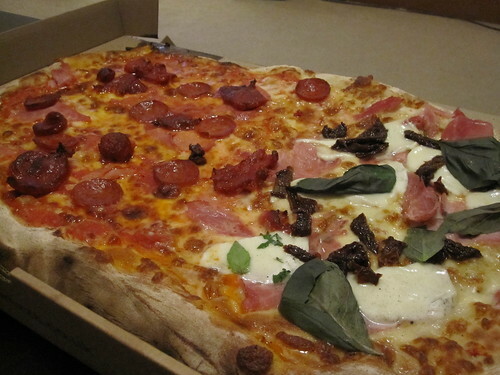 Both pizzas (despite the amount of pork on them) felt much healthier and fresher than London’s thinner-crusted competitors. The toppings were fresh, but I could have used a bit more on the Chorizo, which seemed a little sparse. 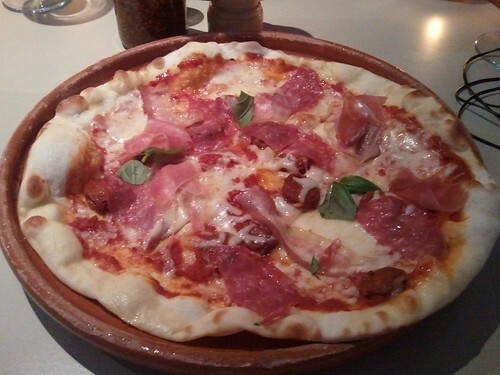 Much better was the Carni, which with salami, parma ham, chorizo and pancetta was bursting with savoury goodness. The verdict…Was it the best pizza place I’ve ever been to? Not quite. It was consistent, service was friendly and it seems like it would be a great place to have a drink and a pizza on a Friday night. Tufnell Park, Kentish Town and Camden residents should check it out, but for those outside the vicinity, I wouldn’t say it’s one to go out of your way for. 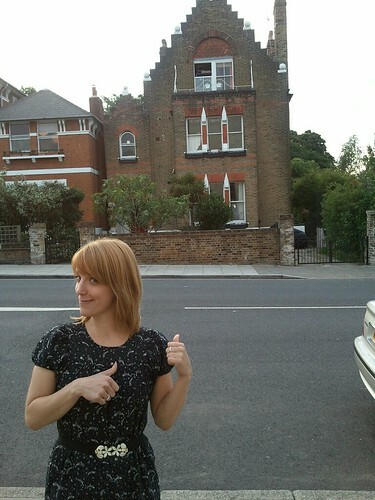 …unless of course you’re a fan of the show Spaced, in which case you can kill two birds with one stone by taking a picture outside the house used as the location of ‘23 Meteor Street’, which is located just a 10 minute walk away. Awesome. Do you want to hear the saddest thing ever? Up until a couple weeks ago, my flatmate wouldn’t eat cheese. In fact, he hadn’t tried it since he was a kid. Just went off the idea of it all. ‘It’s squidgy’, he told me on a number of occasions. I know. Let me give you a moment to pull your jaw from off the floor. When he moved in about a year ago, I remarked that we’d have him eating it in no time. Well, it took longer than I thought it would, but we’re nearly there. The first step was cheese on toast – a mild cheddar. As one could imagine, it was slightly dry – not the first thing I’d eat. 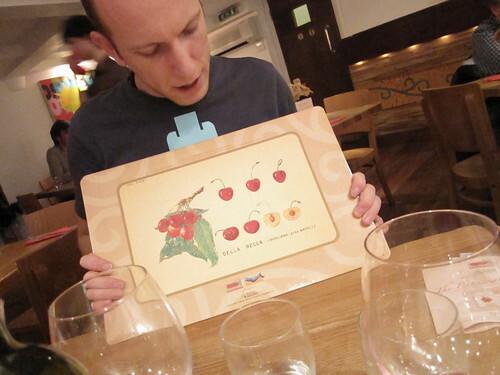 The second step was pizza, so Neil (my other cheese-loving flatmate) and I took Charlie to Rossopomodoro in Notting Hill. Fairly standard, but nice and fresh. And no parmesan! I think he liked this one. 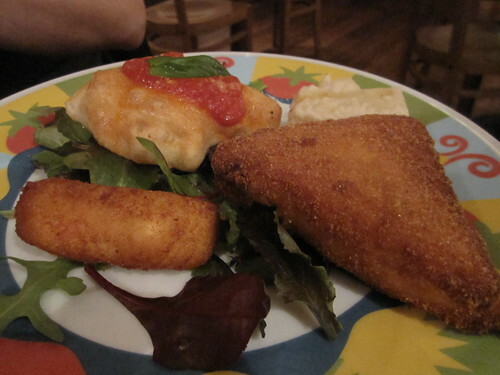 This was an assortment of Traditional Neapolitan fritters – some with cheese, some with potato, all fried to a delicious crispy golden brown. Divided into three sections, this pizza was a bit schizophrenic. Provola and tomato sauce on the left; Ricotta and salami in the middle ;and friarielli (wild turnip tops) and provola on the right. While I really enjoyed the first two, I wasn’t too keen on the turnip tops. Slightly too bitter and overpowering for the milder provola. What was delicious though, was the crust. 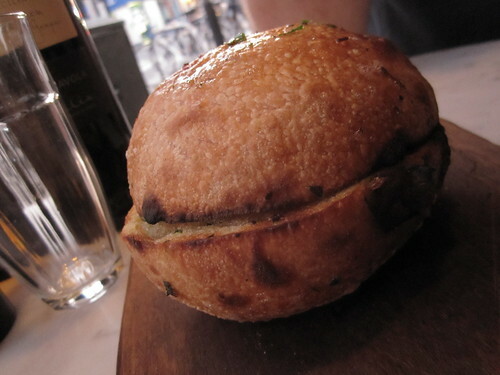 Perfectly structured, but not too crisp – this was really nice bread. Charlie, a bit anxious at this point, had a margherita pizza, which he did actually finish. I think he wanted to say that he didn’t like it, but the fact that he ate the whole thing tells me otherwise. With all of that, and a bottle of wine down, we took a look at the dessert menu. Man, oh man, the choices. Curiously though, 90% of them featured Nutella as a key ingredient. Not that I’m complaining. 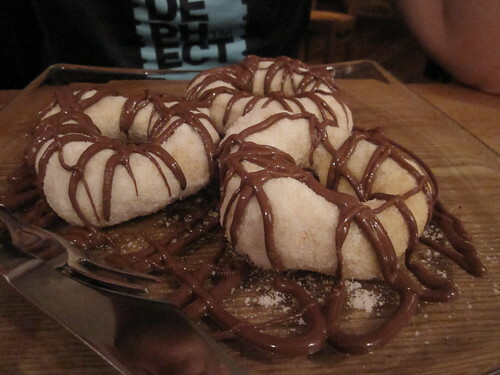 Sweet warm doughnuts iced with vanilla sugar and topped with Nutella – these were the best, by far. 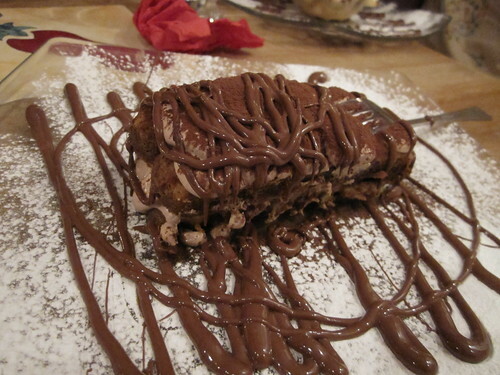 The actual Tiramisu was good – not fantastic, but good. 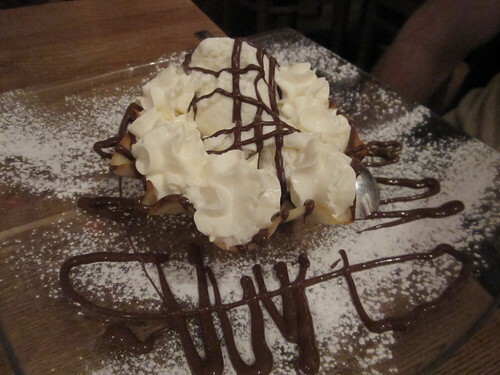 The Nutella was good too (of course), but I’m not sure about the two together. It was a bit heavy. Buffalo milk ice cream topped with (you guessed it) Nutella. I really enjoyed this. It was just a nice subtle flavour. I wouldn’t mind getting it on its own for a nice light treat. I should add here that the service was stellar. 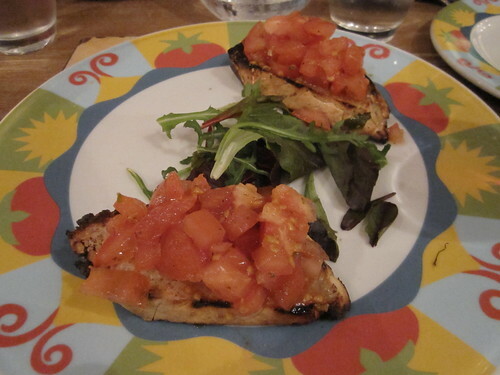 Warm, friendly – very Italian. In fact, I think we may have been the only native English speakers in there, which is is generally a good sign. So that’s it. Charlie’s first real brush with cheese was a success. So much so, that we got Firezza two days later, takeaway from our local pizza place the next weekend and this past Sunday we had Mulberry Street delivered. I wouldn’t go so far to say that Charlie ‘likes’ cheese yet, but he certainly likes pizza. I was at Yard a few weeks ago when the place was absolutely buzzing with all the Shoreditch office locals. I don’t often get a chance to eat lunch outside of a 5-minute walk radius of my office in Fitzrovia, so it was a rather welcome change. 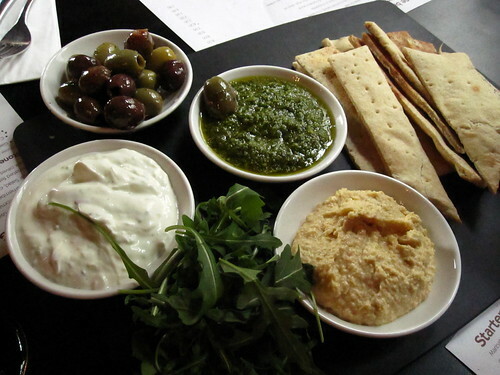 A nice little sharing platter, but nothing more. Everything obviously came out of a jar. I enjoyed this quite a bit. The hoison sauce was a nice blend of five spice – nothing was too overpowering. The duck was indeed crispy. 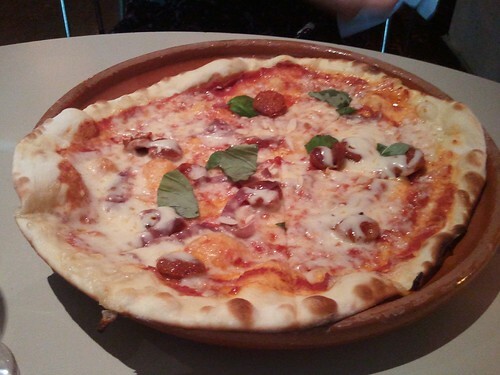 The crust lacked some of the flavour I’ve come to expect at ‘nicer’ pizza joints, but it was certainly edible. 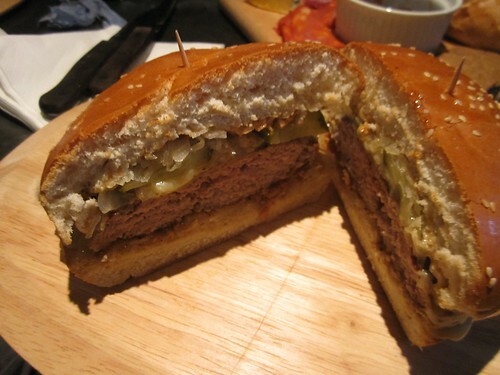 In fact, I ate the whole thing (much to my stomach’s dismay). They were busy, and I can’t complain too much about the service. Everything tasted perfectly fine, but it didn’t leave my mind soaring and my tastebuds reeling. 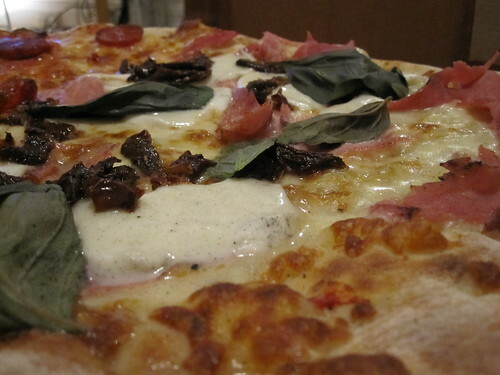 I’d say Yard sits somewhere in between Zizi and Pizza East in terms of price, quality and cache. It’s just a stone’s throw from Old Street tube station, and worth a try if you’re nearby or Pizza East has too long a wait. It was one of those Fridays where you can’t bear to think about making food for yourself. I had had a horrible week, and by the end of it, I was emotionally and physically exhausted. The only thing I could possibly do to get food in my belly was to pick up the phone and have someone bring it to me. Luckily, my flatmate was up for takeaway too. 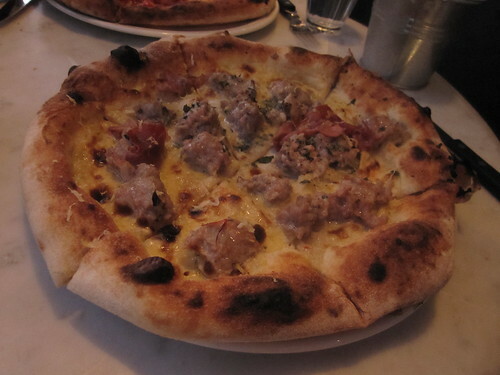 Having already tried Basili, we opted for the ‘pizza by the meter’ at Firezza in Notting Hill. Turns out a meter of pizza is really really big. So much so, that they don’t really technically offer it – you order by the quarter meter. If you order two separate quarter meters, they’ll put it in one giant half meter box. 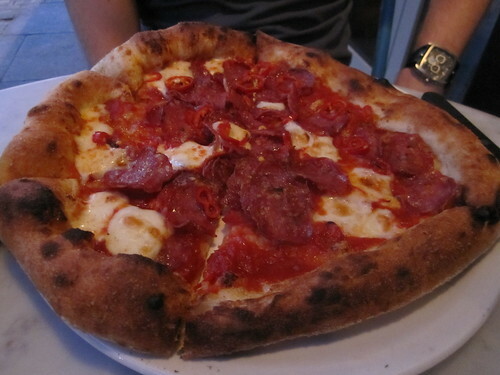 I went for the Mediterranea with buffalo mozzarella, sun-dried tomatoes, and prosciutto, and Neil went for the Mista with pepperoni, chorizo and prosciutto. The pizza was delivered within 40 minutes (5 minutes under their quote), and we got some free bread for ordering online. When it arrived, it was still hot and fresh. Love that. Mine was gorgeous. Fresh basil, tart tomatoes, mild cheese. Just delicious! 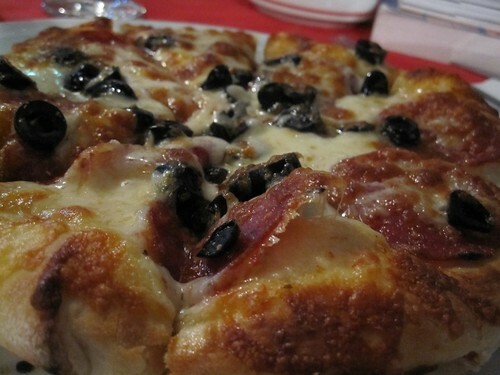 The only other pizza delivery place in the area we’ve been wanting to try is Mulberry Street. I’m very curious how it will stack up. They’ve got a lot to live up to. After train ride to Sinaia in Transylvania, a near-attack by stray dogs, and getting lost on the way to Peles Castle, I was STARVING. Like, raving lunatic ‘You-Wouldn’t-Like-Me-When-I’m-Angry’ hungry. I stopped at one of the first places I saw, a half traditional Romanian restaurant, half pizzeria called Restaurant Bucegi. I was going back and forth about what type of food I should order. 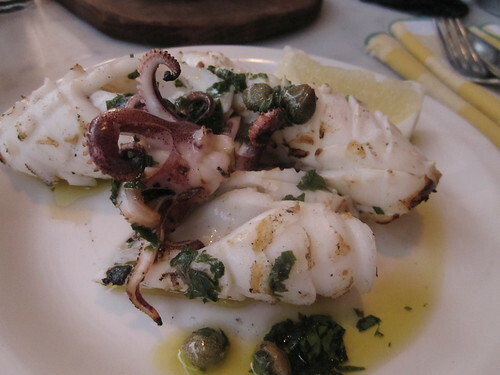 I mentioned in my last post, the Italian influence on Romanian cuisine. The happy result of this is the amazing Italian food in the country. Even though I’d already had pizza in Romania at least 3 times by this point, I opted for it again. I’m so glad I did. 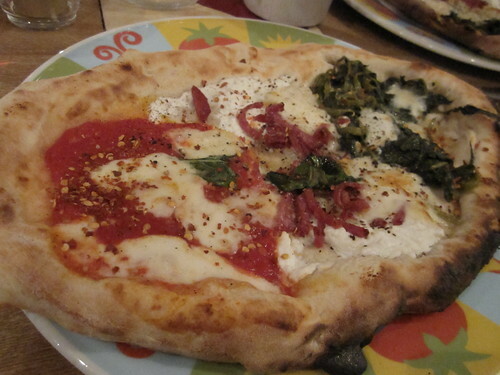 Gorgeous bubbly crust, melted cheese, fresh ingredients… Who’d of thought that a little hole in the wall would produce better pizza than I ever had in Italy? And the thing is, Bucegi isn’t really unique. It’s about the same as every other Italian place I went to. Cheap, good food, and something for everyone. And to top it all off, my bill came out to the equivalent of £6 with a main, a glass of wine, still water, coffee and service.